Boy, do we have a multiplayer preview for you. Walk with us now, as we explore Demon Souls - the PS3 exclusive intense dungeon crawler, set to hit shelves just in time for Halloween complete with co-op. Well, maybe complete is a strong word, the co-op in Demon Souls is much different than you'd expect in a dungeon crawler. No Leroy Jenkins action. No loot splitting. In fact, very odd almost-co-op style co-op. Demon Souls gameplay will give you a quality dungeon thumper title. Loot, pillage, and level up the way you would in any other dungeon crawler a la Diablo. You will be able to passively interact with other players of the game by leaving messages around the world or watching short clips of characters untimely demise. Stumble across a blood stain on a rock, you'll be able to watch that characters death. Entertainment, or quality warning system in place? You decide. Demon Souls isn't just an ominous title, it can actually be taken literally in the co-op aspect of the game. If you come to a battle that is just a little to advanced for your skill, you will likely die - leaving that nice bloody smudge where your body met its end. However, you will still wander around the game as a ghost or "soul", forced to earn your body back in one of two ways. One of these ways is to be a real tool, invading other players games to engage in some player versus player action. If you win the brawl, you get your body back. If you lose you forfeit a stat point in your best stat. So, be a jerk sparingly. The other way to earn your worldly vessel back in Demon Souls is by invading another players game, and helping them. You'll work together to defeat a particularly nasty demon, ghoul, or whatever else that player is struggling with. If you both win, you earn your body back and all of your belongings back. This seems like a much better way of re-entering the world, however unconventional the "co-op" may be. 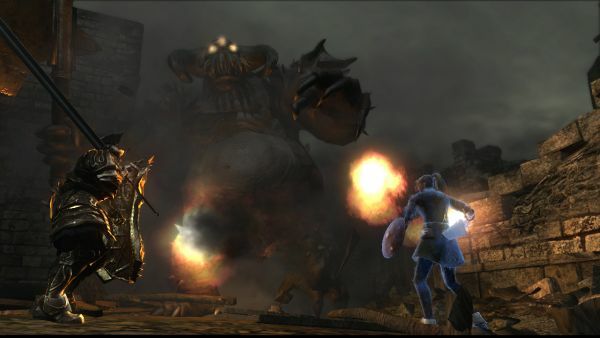 Demon Souls does, however, provide you with other ways to help out other players. The previously mentioned messaging system seems to work as a helpful alternative to co-op. As you leave a particularly nasty area, you can write up a warning to other players so they know what to expect. Players that read your warnings or tips will rate them for helpfulness, so be as helpful as you can. Demon Souls encourages gaming together in a very different way than what we're used to. But, being helpful in games is almost as important as playing with your friends...Right? Page created in 0.3775 seconds.